In today's video, I show you how the reverse masking technique can really add a lot of pop to your stamped images and separate them from a white background, as well as how to make a removable mistletoe ornament with Stately Flowers 5 your recipient can hang from the tree (or door frame for some kisses!) Easy to do, and the movement of it hanging and ability to remove it make it interactive and so fun. A little gift in itself. TIP: Add a photo or write the year on the back side. I forgot to say in the video, after the ornament is removed, it would be nice to have a photo inside to show through the open window! 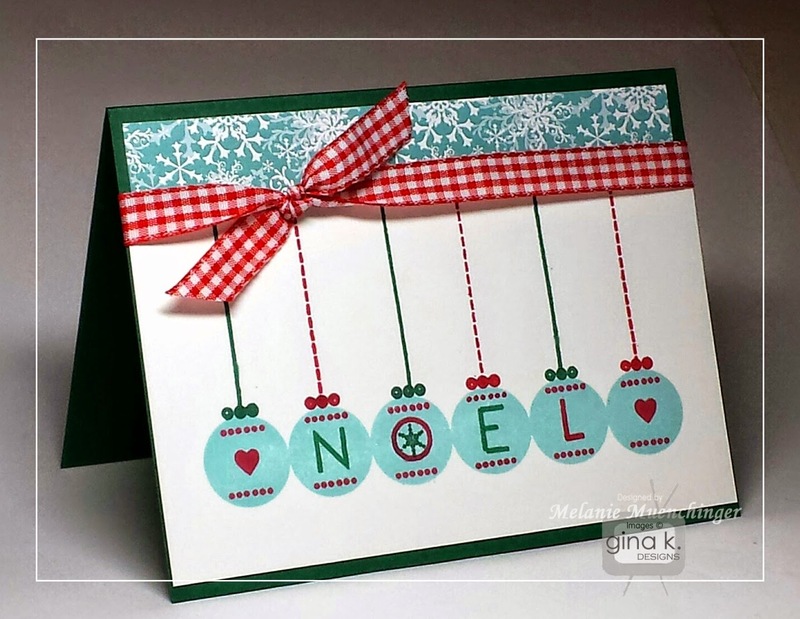 You can also use two cardstock colors and mix and match the round ornament in the centers! 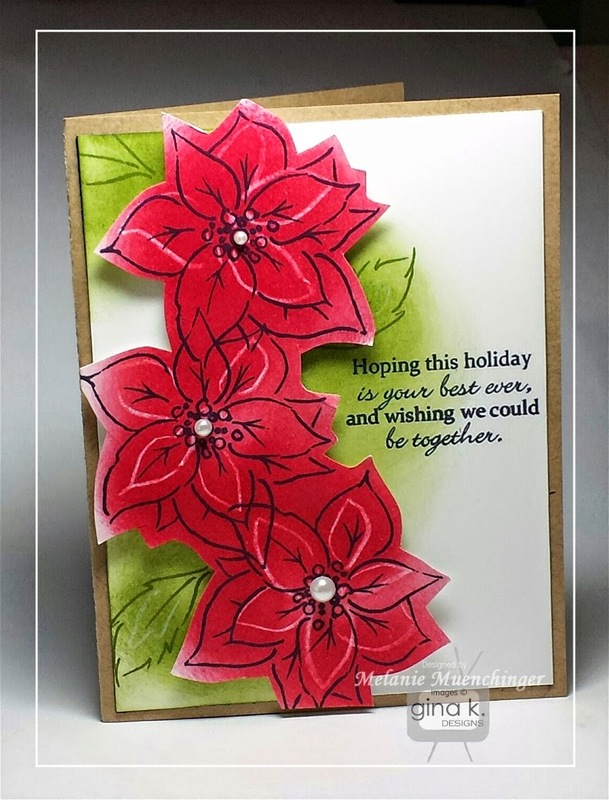 Well, I wish I'd posted some cards and videos with Stately Flowers 5 earlier this season, but there's still time to make lots of cards and ornaments for your holiday projects with the beautiful mistletoe! CardMaker featured a gate fold card I made with it on the cover of their Happy Holidays Special Issue, and it is on the newsstands until December 1st! I hope you pick up a copy! In addition to very inspiring projects and and techniques, it is filled with bunch of really unique recipes that are new to me and I fully intend to make! Perfect for snacks, the holiday meal, and gift giving, you've got to check this out out! As you can see, there is a "Merry Christmas" stamp in this set, but I couldn't find it when it was time to make the card and roll! So the one in my video above is from the Stamp TV kit, but virtually any greeting and font will work with this realistic mistletoe image. 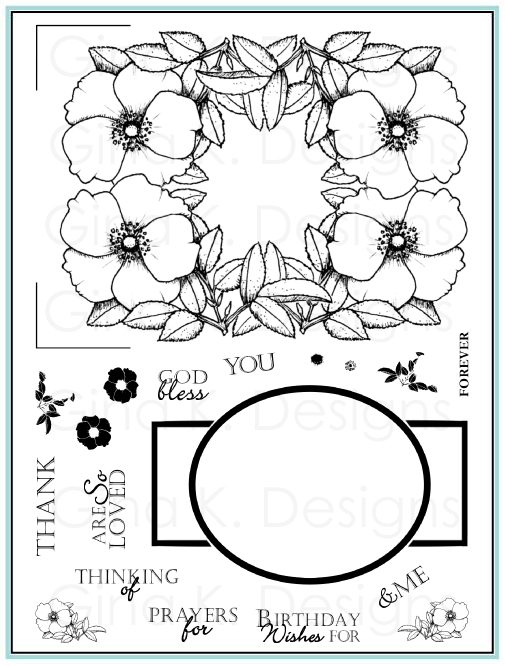 This set also contains a sunflower which is a favorite image of mine for cardmaking, and you can see how to color it in this video I posted previously. Have a fabulous day! Are you ready for Thanksgiving? Good morning, all! I'm excited to bring you today's Mix It Up Monday challenge for StampTV. My challenge is “All Things, Great and Small”. 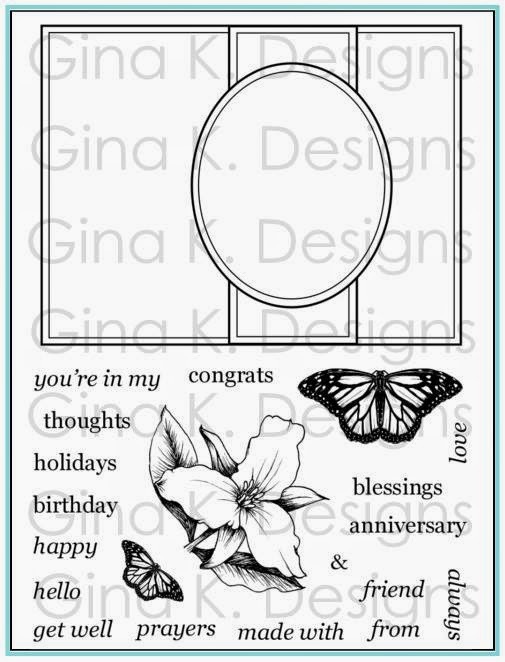 For this challenge, please incorporate both large stamped images and very small stamped images into your card design. Whether that be a large focal point and small images to make a background, mixing to create a collage pattern, etc, it’s up to you! Lots of ways to interpret this one! Images do not have to be from the same set, although this works well for coordination and often sets are planned to include large and small scale images. 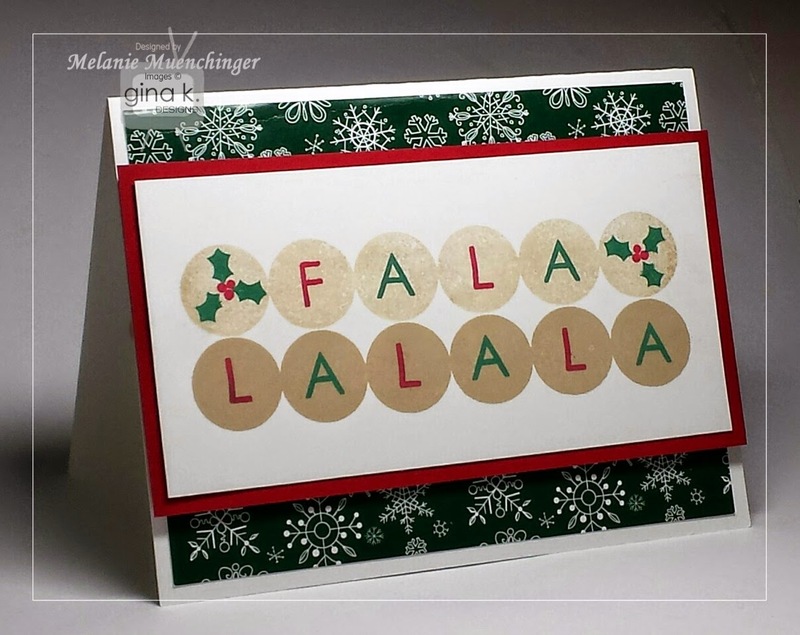 My card uses the tiny images from Fabulous Holiday Fillers to accent the large triangle borders from Lots of Letters 2, which I stamped "stacked" to create a harlequin pattern. Isn’t that fun with the snowflakes in the centers like medallions and the trees and bells offset? 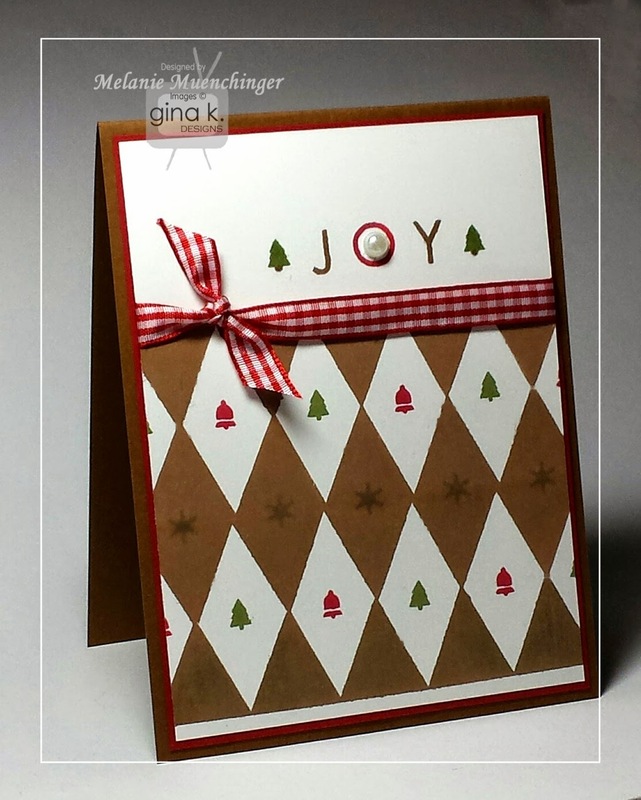 Cardstock is GKD Pure Luxury Warm Cocoa, Cherry Red, and White. Ink is GKD Cherry Red, Fresh Asparagus, and Warm Cocoa. I hope you play along with me this week! I can't wait to see what awesome cards you make! 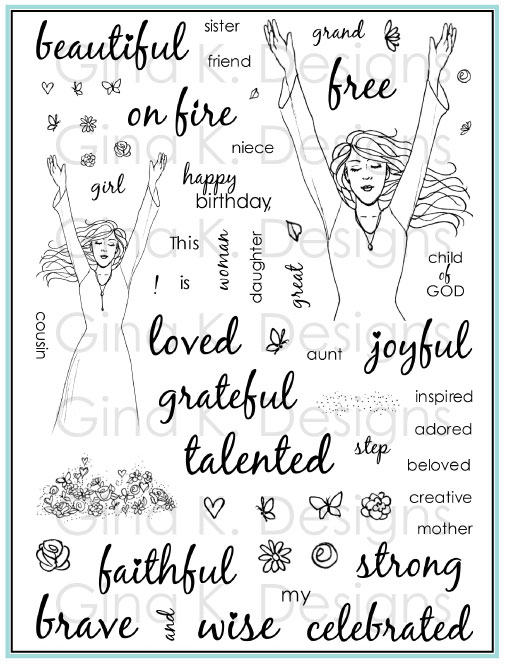 When uploading, remember to use tags, using the key word STV14MON46 and include which stamp sets you used as well. See this post for some additional challenge details. Thanks so much for joining me, and have a fabulous day! It's Friday, woot! Early video post! :) In today’s video, I will show you how to spell out a fun greeting with my Lots of Letters 2 set and accents from Fabulous Holiday Fillers. 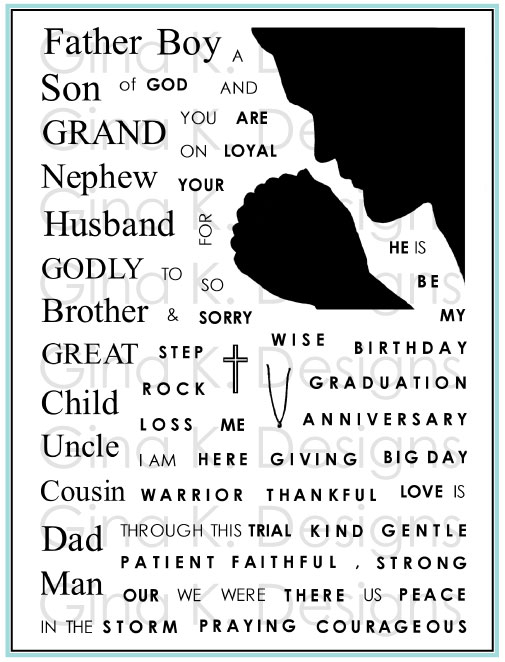 This is a quick card and design that lets you take it “inside” the card for a fun surprise! You can add lots of short words for any occasion in this fun circle border, which adds a pop of color and makes letter placement easy, and the holiday elements can be changed out to work for season. In this one, I used some of the different Fabulous Holiday Fillers elements to turn them into hanging ornaments. To "hang" them, use the dashed and straight line from Lots of Letters 2 or Fabulous Frame Fillers. 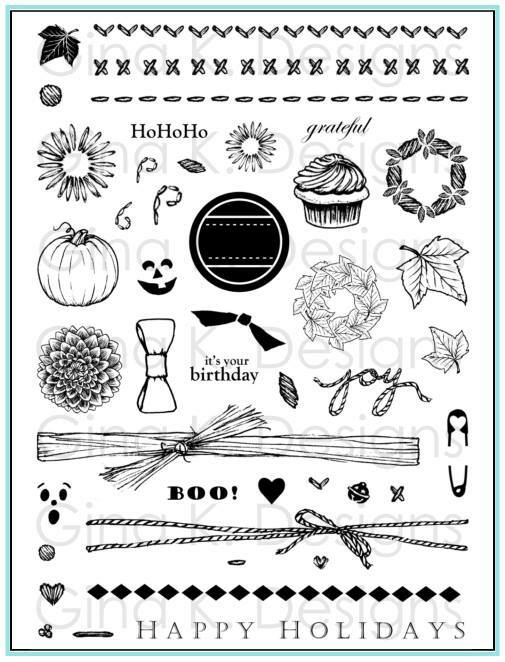 You could also use a piercing tool or Scor-Bug embosser to create the lines. And for more ideas and videos with Lots of Letters 2 if you missed them the first time around, click here. 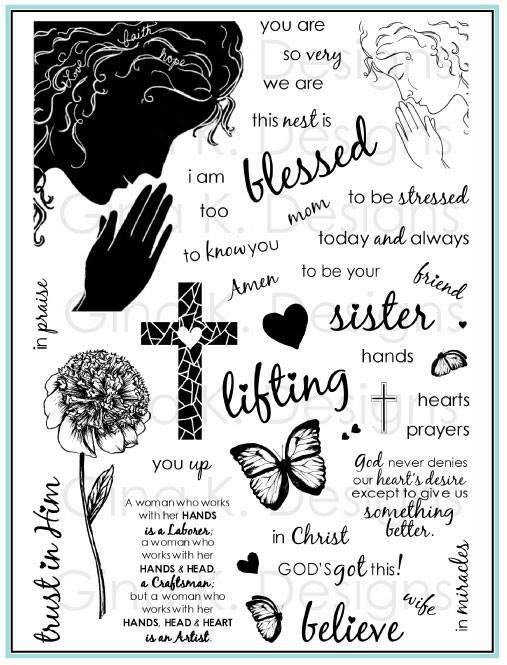 Love the looks of this.... very pretty card! Thanks for sharing the technique! The calendar sounds awesome! Congrats, Denise! Please email me your snail nail address so I can get it out to you! Thanks everyone for playing! I hope you enjoyed the video! If you have not yet seen, please watch here! This is such a fast, easy and effective technique! Resist Technique and a Giveaway! This giveaway for this post is now closed and winner is posted here. Please enjoy the following video! Good morning! Today I will show you how to do a crayon resist technique with my A Year of Flowers 2 set. The sketchy, whimsical style of these seasonal flowers is perfect for this technique! 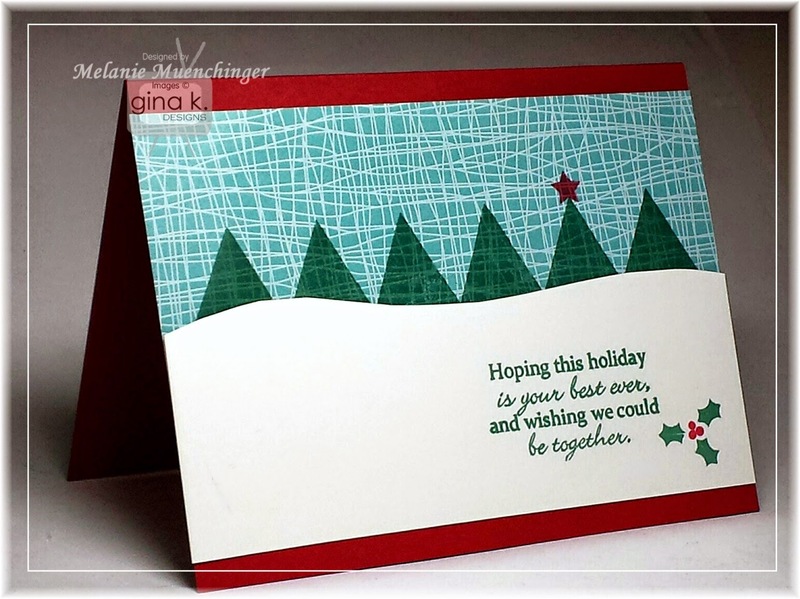 You will love having these pops of color on your holiday cards, so easy for mass production. This technique is traditionally done with a white crayon and glossy cardstock, but I have found that in a pinch, you can substitute regular white cardstock and a white pencil, producing slightly softer but still beautiful results. Greeting is from Fabulous Holiday Fillers. 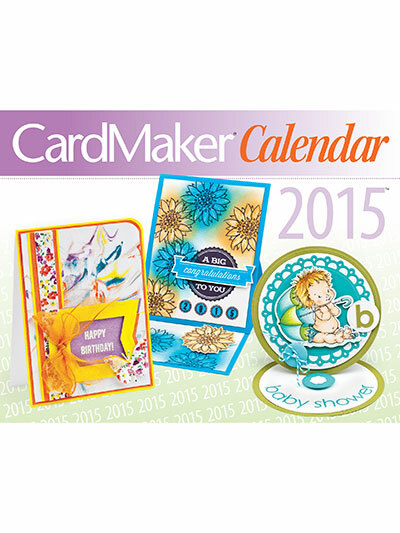 I am also giving away one 2015 calendar from CardMaker, which features a resist technique project by me (and cards from other designers you know, like Theresa Momber!) 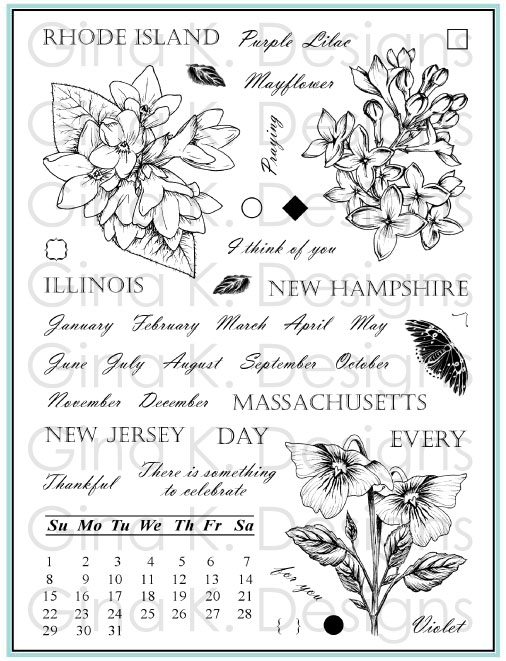 This 12 month, 12 projects calendar includes detailed instructions for each card, as well as little known holidays in addition to all "the biggies", so fun! Winner will be drawn randomly and announced here Wednesday, November 13th. To enter, please leave a comment below. Subscribers to my blog and Youtube channel get an extra chance. Sign up today if not already! 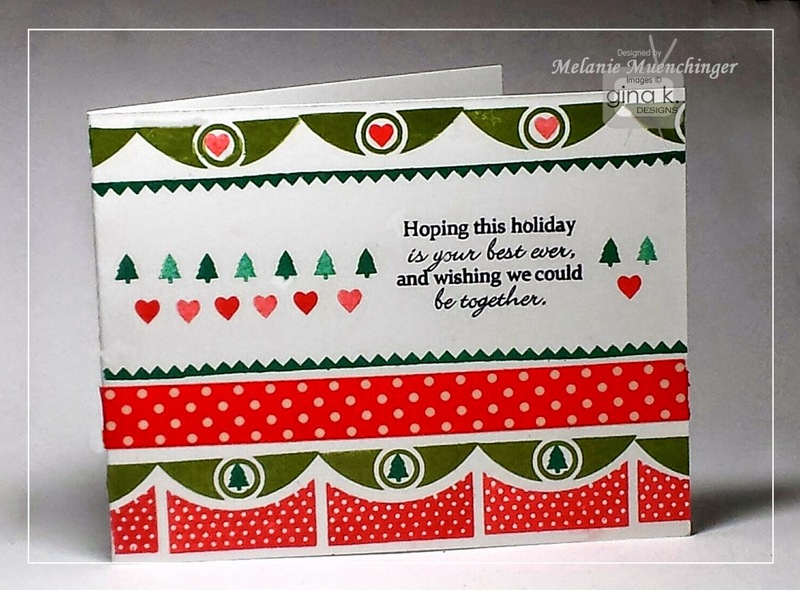 Here is a quick card I made the day I got my Fabulous Holiday Fillers set in the mail and wanted to test out some of the images. (I don't think I've shown you any cards with the snowflake border!) I may have gone a *little* overboard on cascade of holly, I think less is more, but just to show you another option! 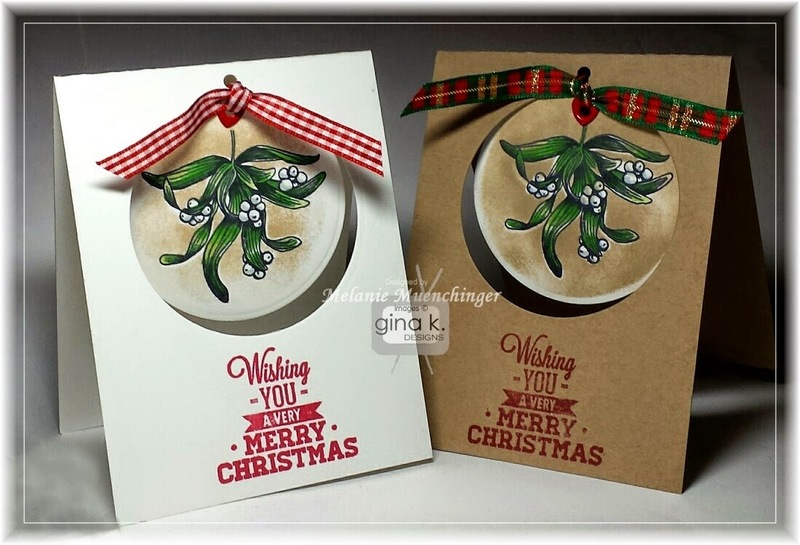 I used GKD Cherry Red and Red Hot for the berries and GKD Grass Green and Fresh Asparagus for the holly, both stamped and stamped off. This is a single layer card. I like this card better in real life: the frame and snowflakes are actually stamped in GKD Navy, but it photographs really dark, looks black. I love the GKD In the Navy cardstock and coordinating ink but I don't use it as often for designs for the blog because it does look so black in my photos. Anyway, the navy stamping looks really nice with the blue tones in the borders and belly band, softer than with black ink. Checking off my Christmas card list, one at a time...! Seeing how many Christmas cards I already have made is encouraging, but knowing how many more I'd like to send is a little daunting! So I'm challenging myself to come up with some quick, but still interesting, designs! I love how this turned out! 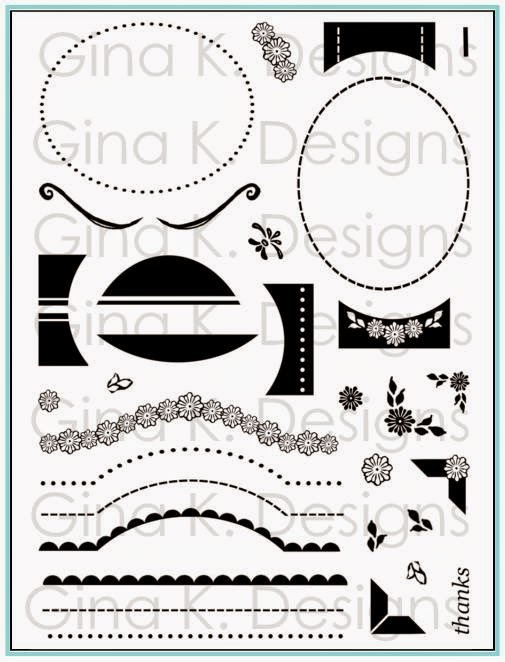 I noticed the long triangle border in Lots of Letters 2 set flipped would make a perfect row of graphic trees! 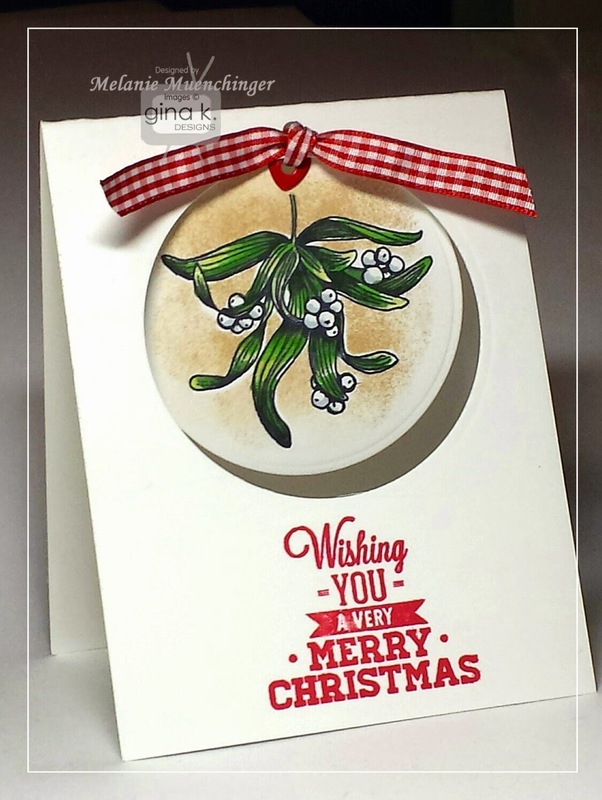 I stamped it in GKD Christmas Pine ink directly on a piece of aqua patterned paper from the GKD Winter Cheer paper pack (always love using blue patterned papers for sky! Linking it now I am remind there is aqua snowflake pattern in that pack that would be even more appropriate. But I like the funkiness of this weave, actually, unexpected!) ) and free cut a very gentle curve on a piece of GKD Pure Luxury White cardstock to mount in front for snow bank. 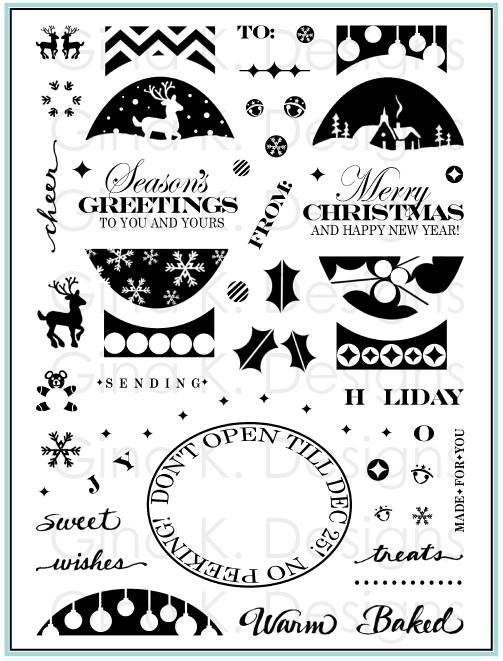 I stamped on the star, also from Lots of Letters 2, and then added my greeting and 2 step holly bits, both from my new Fabulous Holiday Fillers set. Card Base is GKD Pure Luxury Cherry Red to match. TIP: You could add more stars to the trees , but to *me*, one is usually more interesting than adding them to all, makes that one extra special. I offset it rather than stamping it in the middle, to move your eye around the card. I love little "aha!" moments like this! 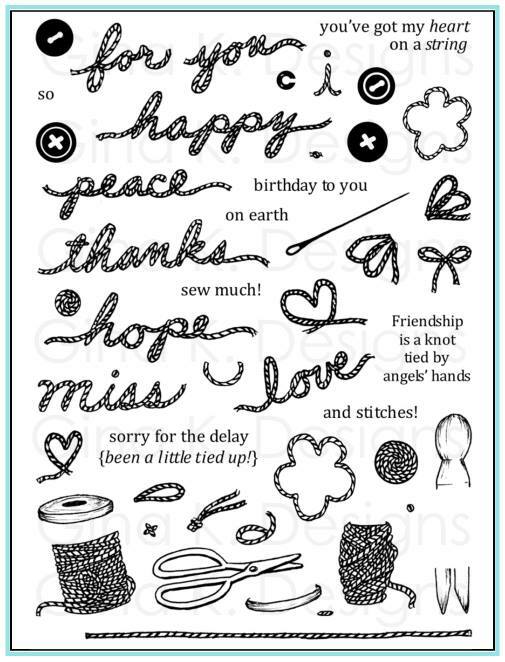 That's one reason I love shape stamps so much, and include them in so many of my sets. So many uses! I was actually trying to come up with something new for my next video, but this one is so simple, I'm just posting the card and details, no demo necessary, I don't think! But thank you for pushing me to think outside the box! I love trying to surprise and inspire you all, dear readers! Good morning! Today I am showing one of my favorite cards from ths release that I shared at our party, showcasing Theresa Momber's Peace and Joy and my Fabulous Frame (back in stock, but not for long!) 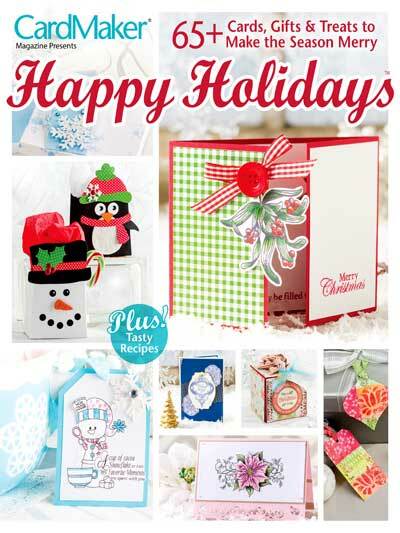 and new Fabulous Holiday Fillers set. 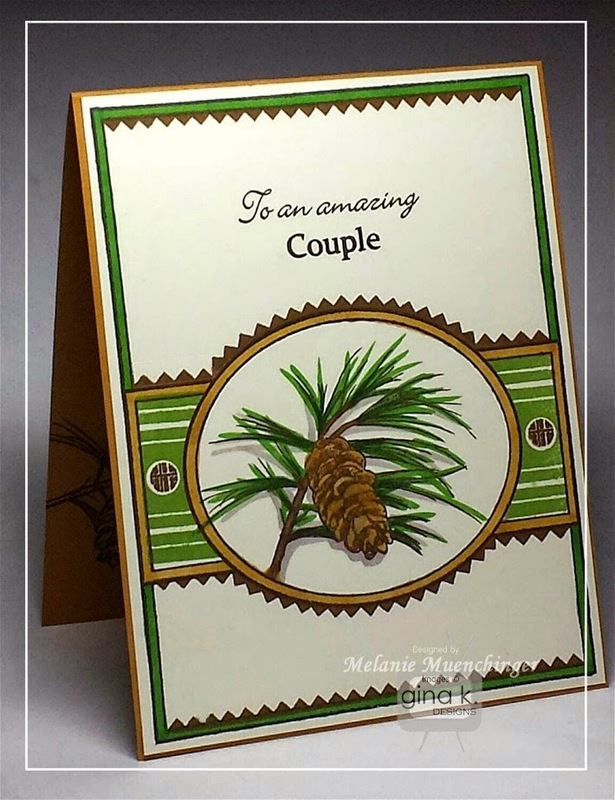 I stamped the pine cone image into the Fabulous Frame and then added some of the new Fabulous Holiday Fillers. I thought the points in the pinking borders (stamped in Dark Chocolate) went really well with the petals of the cone and needles. Doesn't that look *so sharp* across the top and bottom?! I love this new border! Love! I filled in the belly bands with these new ones from the Holiday Fillers set stamped in Grass Green and added the smaller plaid circle inside, again in Dark Chocolate. I prefer the smaller circles in this belly band to give you that little ring in between the colors. Just love how masculine all these pieces are, work for so many designs, but then also can go completely flirty and feminine with different color or focal points. Base is GKD Pure Luxury Prickly Pear. 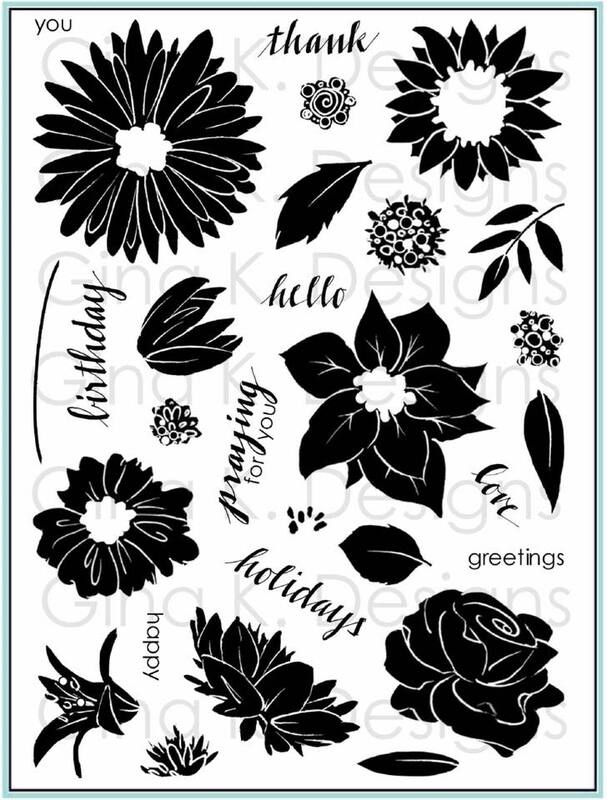 This golden cardstock is so gorgeous for the fall and winter holidays! 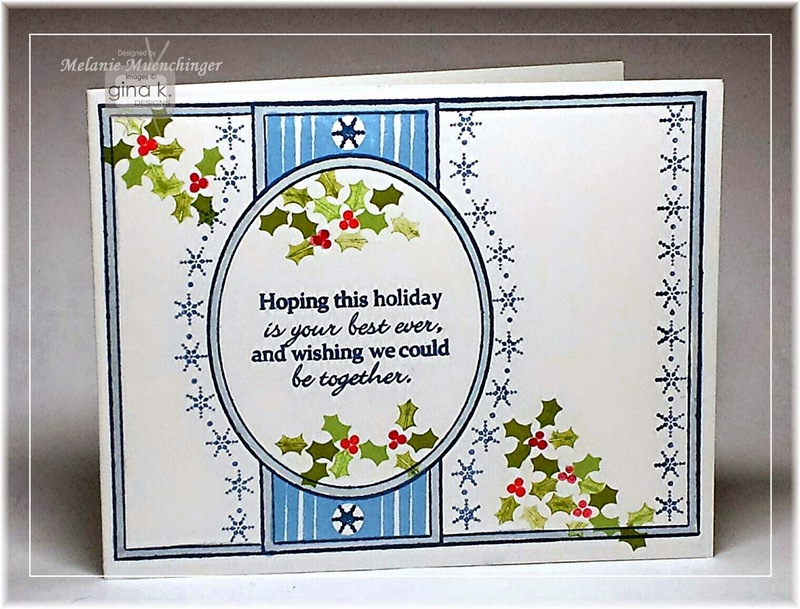 I colored the borders with Spectrum Noir EB3 and DG3, and stamped the sentiments from Fabulous Holiday Fillers above, thinking this card was perfect for my dad and stepmom. PS Pssst. Fabulous Frame Fillers stock is very low, too, after yesterday's video. Don't miss it! Have you been to a Crazy Christmas Sweater party? Do you own one? You know, with a zillion colors and patterns? :) Well, that's what I was thinking of when I made this card with Fabulous Holiday Fillers! I don't care for the half circle as a border as much as I like the belly band "scallops" (watch this video), but I am all about trying to create some new looks, as you know. ;) I have to say, I do really like the little rows of Christmas trees and hearts, that part is my favorite! The trees and hearts are both stamped off in between to create the lighter shades. I was playing with the washi again, too. This is a single layer card. My Christmas card is stash is growing! The giveaway for this hop is closed. Hope you still enjoy the hop! Good morning! 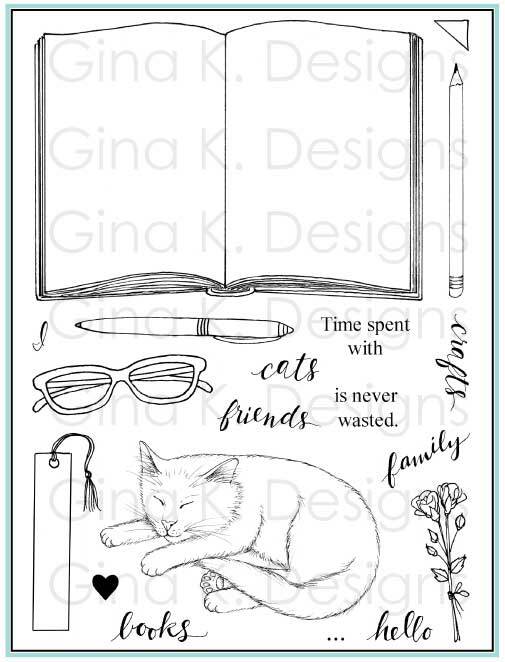 Today some of us from the Gina K. Designs team are showcasing some past favorite sets from Gina K. illustrators Debbie Corbari and Beth Silaika. Another mini hop to start your Monday right, we hope it inspires! Grab your cuppa'! 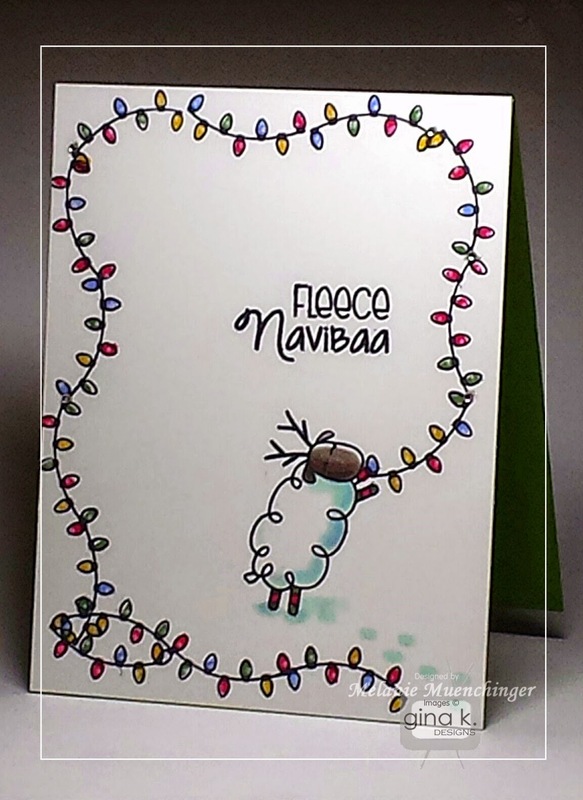 We also have another prize today: the Fleece Navi-Baa stamp set by Debbie Corbari! So be sure to comment on the blogs as you hop through for more chances to win! We will draw a name randomly from one of the blogs and will announce it Tuesday in the StampTV forum. Next, I am sharing one with Debbie's Fleece Navi-Baa! Well, I love Christmas, and I love puns, and I love SHEEP, so this set is a winner times three! I love how "poseable" these different little sheep appear, so I had to make some framing with the little strand of lights, imagining the "Clark Griswold" places he might take it! Images are stamped in GKD Black Onyx and colored with my Spectrum Noir markers: BG6 and BG7 for face and ears, DR3, DG3, BT3, GB6 for the lights, and IB2 for shadow and hoof prints in the snow. Finish with Wink of Stella pen swiped on body and lights. Cardstock is GKD Pure Luxury White and Grass Green for the base. Now please continue to enjoy the hop and have a fabulous day!